The 3-star Novotel Suites Hannover Hotel boasts a stylish lobby in warm colors. The suites are spacious with comfortable furnishings, and feature a bathtub and kitchenette with tea and coffee-making facilities. Friendly service, free WIFI and Sky channels guarantee a relaxing stay. The train station, city center and many tourist attractions are all within walking distance. On Thursdays, guests can enjoy a free massage at their Novotel hotel. Clean, convienent for groceries and restaurants, friendly employees & a good espresso machine. Room was clean and attended to every day. The breakfast was good with a good espresso machine and good orange juice. Friendly employees all around. Hotel lobby was a little crammed and some tables, areas of the hotel are damaged before we arrived. Best thing about the hotel was the Quinny stroller rental, it was a total lifesaver. Would be best if we could purchase on site if option was available! Coffee and tea was limited for a period of time, but guests of the hotel come and go at different times. For exhibition attendees with family, we did not get the opportunity to enjoy breakfast or a banana with coffee when we left and when we returned. We loved the unique nautical layout of the rooms but the bathroom being separate from the shower room was different and we wished they were all together (or if there were two toilets). This was mainly a business trip but I brought my family. I also have Novotel membership from Taipei Taoyuan but it was not used for this booking. My friend's bag was stolen when she was checking-in in the front desk, the hotel lobby has 3 opening doors, not good security control in the lobby. What hotel should be. Warm welcome at the front desk. Happy smile. As always, all of my needs are provided by Novotel Suites. Staff is accommodating and friendly. Will definitely be back in this hotel. Hotel's location is very convenient, staff is very friendly and helpful. Lobby area is nice, modern and tidy, rooms are a bit outdated but very clean. Check in was very easy, and the reception staff provided ample information of what to do in Hannover with young children. The hotel is directly opposite Hannover central Bus Station and the Hauptbahnhof . It is also within a walking distance of the city's tourist hotspots. We like the friendliness of the members of staff and the fact that there's a children play area in the main lobby. My wife and kids enjoyed the breakfast while I used the gym, which although it's very small, was adequate. I just think perhaps, they need a bigger fitness training room. I'll recommend this hotel and we'll stay here again when next we are in Hannover. I was very satisfied as ususally. I have big room, which are clean, with internet connection. I appreciate also small &quot;kitchen&quot; where I can prepare tee or coffee and fridge for some food. The front office people are very nice, and accommodating as always. However, I am not so happy with the housekeeping, because the towels were not replaced even if I placed it on the bath tub already. And when I requested the room to be cleaned on my 3rd day, they just put the towel but did not clean the room/toilet. I received good atention and the room was comfortable and nice. I received good and fast attention. The location of the hotel is perfect, just one block away from the hauptbahnhof, and directly in front of the tram station. The room was clean, spacious and comfy. level on room clean service (specifically the bathroom) really poor. The bath room was stinking. The overall experience with reception was fine, but the room had a curtains broken and bathroom was smelling really wrong. Apart from slow check in process, where attendant behind desk was on the phone for a long while, my stay for business purposes was adequately met. Staff is friendly and accommodating. Room is very clean. All staffs were very kind. During business trip, this hotel was very comfortable and all staffs were very kind. It was perfect. 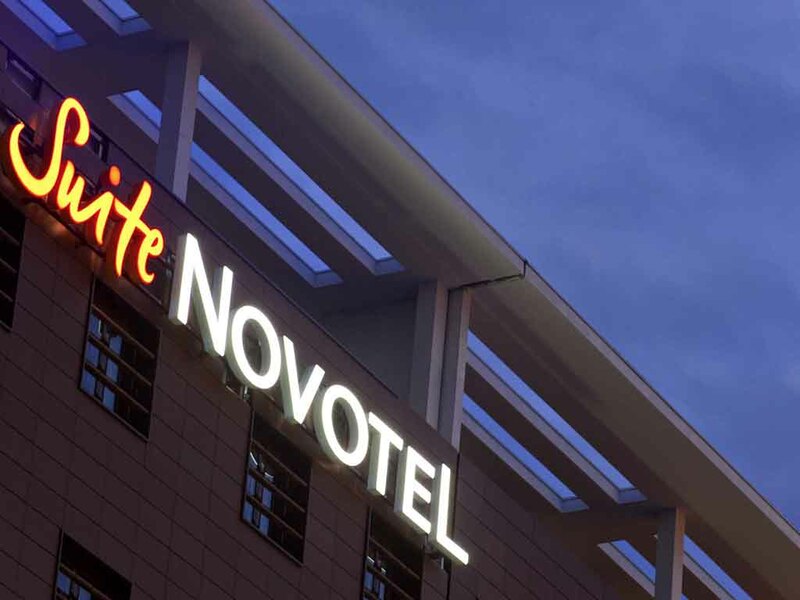 I like Novotel Suites Hannover city.